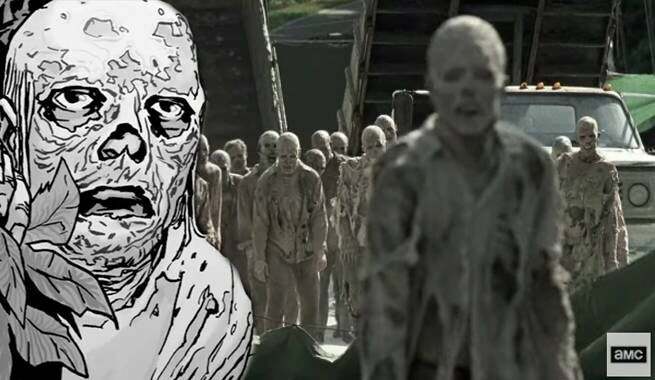 Did The Walking Dead Season 7 Trailer Introduce The Whisperers? The Walking Dead's Season 7 trailer featured so many things for fans to get excited about that we may have all overlooked one major, gigantic, terrifying thing: the Whisperers. For those unfamiliar with the comics, the Whisperers are a menacing group of enemies who come into play after Rick and Negan's feud is settled. They wear the skin of the dead and walk among the roamers, constantly keeping their voices down and living like savages. They blend in with the undead and pose a massive threat to Alexandria and the other civilized communities. For argument's sake, let's get why the Whisperers would not have been in the trailer out of the way first. The first appearance of The Whisperers (though they may have been posing as walkers earlier) came in issue #130. A group of the mysterious foes were following Marco and Ken, characters yet to be introduced on television, and their whispers were heard leading the two to believe they were either crazy or the undead were speaking. The TV series ended its sixth season at a story point equivalent to that of issue #100 and six seasons in has moved at a pace of about 20 issues per season. This would indicate the Whisperers wouldn't arrive until at least Season 8. All of that said, the show seems to deviate from the comics in at least one significant way every season. Based on the closing moments of the Season 7 trailer, it seems the Whisperers just may be arriving earlier than expected. While we were all freaking out over Ezekiel, Shiva, the Kingdom, the Sanctuary, Negan, and every other epic moment from the new footage, most people never took the time to analyze the bonus season after The Walking Dead's logo crossed the screen. Tara and Heath found themselves out in the woods facing what definitely looks like a new threat. Could that threat be the Whisperers? It's possible. A horde of zombies is seen rising up from some sand or dirt but then a larger, sand covered and dirty looking group is seen stumbling towards someone. Tara and Heath are definitely feeling threatened, as just prior to seeing this horde we see Tara hiding in the woods with a clearly non-zombie enemy running by. While the Whisperers act like zombies when they have to blend in, if their life is in danger they will run if they have to. Let's not forget, back in Morgan's "Clear" episode, he said to Rick that he saw "People wearing dead people's faces." Clearly, Morgan may have encountered the group or at least a similar group months prior to anyone's arrival in Alexandria. It wouldn't be unlike the Whisperers to migrate North, though. The group simply sets up camps and claims territory. Whether or not they stay in one region is unknown. The Walking Dead returns for its seventh season on October 23. For complete coverage, insider info, and more all season long, follow me on Twitter @BrandonDavisBD and check out The Walking Dead on ComicBook.com on Facebook.